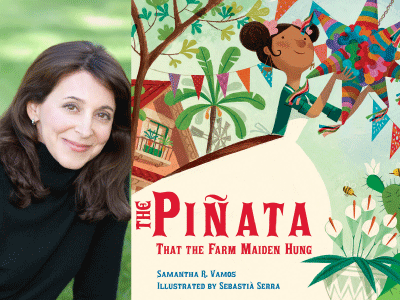 A young girl sets out on errands for the day, and while she's gone, the farm maiden prepares a piñata from scratch with help from a boy, horse, goose, cat, sheep, and farmer. After they all fall asleep in the afternoon sun, they must scramble to finish preparations in time--just as the girl arrives back to her surprise party. Key English words change to Spanish as the cumulative verse builds to the celebratory ending. With the familiarity of "The House That Jack Built," the tale cleverly incorporates Spanish words, adding a new one in place of the English word from the previous page. This book makes learning the language easy and fun. Back matter includes a glossary, definitions, and directions for making a piñata at home.